Whether it’s the expanding the wild-card round in baseball to the logos on jerseys in the NBA, change in sports and the business of sports almost always feature multiple and often conflicting perspectives. Perhaps the one exception to this rule was the move from the BCS era of college football to the playoff era. Despite the consensus that the BCS didn’t work, in its first three years, the college football playoffs have failed to drive the kind of demand at the box office that many expected. Thanks to a combination of strong matchups, and a mix of classic and brand-new venues, Rose Bowl tickets and Sugar Bowl tickets for the 2018 College Football playoff Semi-Finals have big-bowl prices. Over the last two years, the first four semi final games had an average price of $263 on the secondary market, with the cheapest tickets under $100. 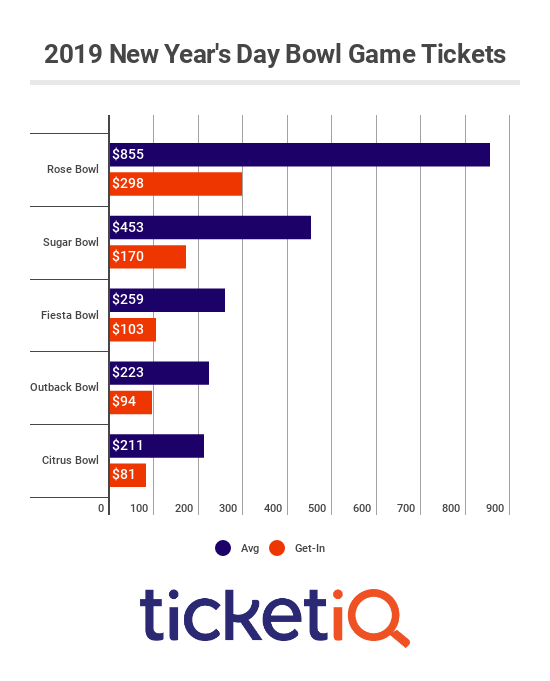 For the 2015 Orange Bowl where Clemson played Oklahoma, tickets could be had for $32, well below face price. Only the Alabama and Washington 2017 game, whch was the Georgia Dome’s final Peach Bowl Peach Bowl, had prices typical of a New Year’s 6 Bowl. 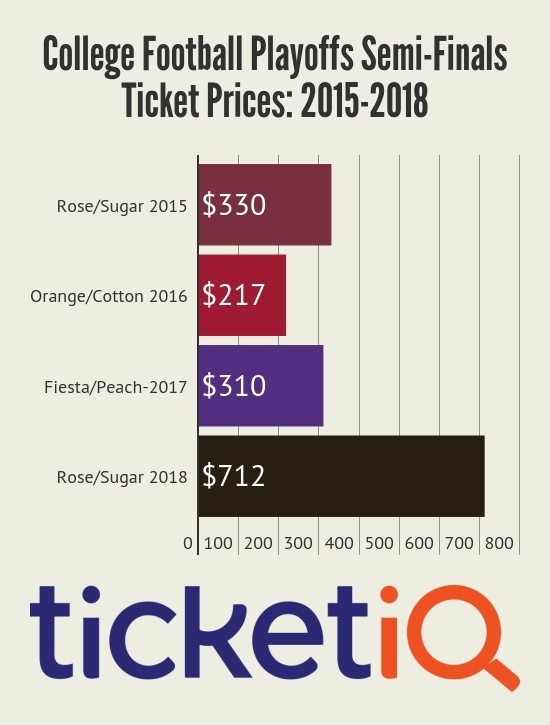 This year, both games are historically high, with Sugar Bowl tickets for Bama-Clemson III at an all-time high, while ticket prices for Rose bowl tickets between Oklahoma and Georgia are the third-highest TicketIQ has ever tracked. While the ‘Grandaddy of them all’ is in high demand this playoff season, over the previous three years of Rose Bowl Tickets, the two playoff games had an average price of $533 compared to an average of $633 for non-playoff games. For the 2018 college football playoffs, the two Semi-Final games are finally seeing a level of demand that college football surelly hoped for when planning the new format. While the Bama-Clemson game is being driven by proximity to the venue, for the Rose Bowl, Georgia and Oklahoma fans will have to travel a combined 3,500 miles to see their teams play for a shot at the title game in Atlanta. On Priceline.com, the cheapest cost for a roundtrip flight to Los Angeles from Atlanta costs about $600. UGA fans in particualy appear to be willing to splurge on the team’s first Rose Bowl since 1943. If they’re able to beat Baker Mayfield to secure a spot in Atlanta for the championship game, tickets are currently available starting from $1,500, three times the price last year at the same time. The good news for all those Georgia fans spending money on the sem-final game is that for the National Championship they’d be able sleep in their own bed, and maybe even drive to the game. TICKETIQ HAS LOW PRICE GUARANTEE LISTINGS FOR BOTH ROSE BOWL TICKETS AND SUGAR BOWL TICKETS. FIND A BETTER PRICE AND WE'LL GIVE YOU 200% OF THE DIFFERENCE!